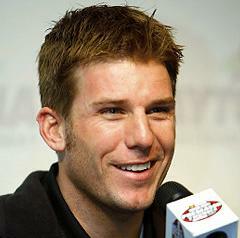 I’m joined by Joplin native and NASCAR driver Jamie McMurray of the number 26 Crown Royal Ford Fusion. Jamie finished this past season strong with five of the last six races in the top 7 including three third place finishes at the end. It’s been a busy off-season for Jamie, he’s been in Vegas racing go-karts, in New York shopping for wedding rings, and now has the good news that he’ll be joined in 2009 with Donnie Wingo as his Crew Chief, a guy that Jamie considers a close friend away from the track. Listen to Jamie on my Press Podcast .